Just a brief note today, a lot has transpired since I last wrote a piece in this series. 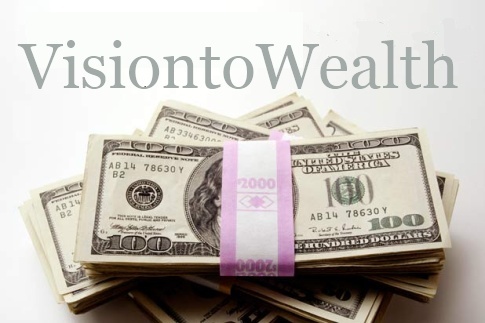 In the interim I have regutted the "Visiontowealth" Web site and introduced another site "UofMoney". Both go hand in hand. With this piece I will introduce a new HTML format and will try it out for a spell. There is also a plain text version depending on how your email program setting will determine which version you get. The Salesman couldn't help but notice that the Farmer's Dog was extremely fidgety, he asked the farmer what was wrong with his dog. The farmer replied that his dog was sitting on a nail. So the salesman asked, "why doesn't he move"? The farmer's reply, "He's not uncomfortable enough yet". Do you get ever get the sense that all is not right with the ways thing are? Do you get the sense that things are not the way you imagined it would be when you were a few years younger - what if anything is wrong with this picture? Well let me tell you another story. Its all in how you look at it. Cheri Hubert, a world renowned Zen master would say that "what you see on the outside is a what you see through your own filters". The reality is that we all live in a land of opportunity a land of abundance. To paraphrase Jay Abraham, a mentor of mine. "Opportunity is like a bus stop if you miss the bus there's always another coming around the corner." I once had the opportunity to have lunch with Robert Kiyosaki, this was at a marketing convention a number of years ago in Vancouver, long before his Rich Dad, Poor Dad fame, he had just come out with his new "Cash Flow Game" and this was the first time it was being presented. What Robert says is, "I kick myself for not being able to see all the opportunities around me"
The problem is you may not see the world that way as you have been conditioned to look the other way. Let me tell you another story. Do you know that 90 percent of the time it's a woman who is driving a white car. You would never of noticed that but once you are aware of the fact, you will see women driving white cars where you never have before and so it is with opportunity. The trick is your conditioning, how the conditions around you have molded you to be totally oblivious of the fact that we do live in the world of abundance. Its this conditioning our default mode of behavior that we are most comfortable with that keeps us where we are. Explore the world of possibilities, open your eyes for opportunities but first remove the cloudy filters from your mind so you can recognize it. This is where you come in, where you can self program yourself by changing your filters by defining what you are looking for and you will see women driving white cars every where you go. The question is how do you do this - I would suggest that the only way "you can see clearly now" is to look at the world without colouring it with your own filters. - to come into the situation without any preconceptions, pre-definitions or pre-judgments - to come into the world from a completely neutral position. As I write this Ickiro Suziki, the batter for the Seattle Mariners, just broke the all time National and American league record for the most number of hits in a season. What makes him so special - physically he is relatively a small frame of a man. It is speculated that it is because of his mental conditioning.Once he up to bat, he goes through a ritual, clearing his mind of all distracting thoughts so his focus is only on what 'is' not what he thinks 'it' is. And so coming from a neutral position his mind is free to make multiple split second decisions so the opportunity to act doesn't pass him by. Getting on base after all is the first step in getting into a scoring position. Seeing opportunities is really all about getting out of your own way. Review one of the precious articles on detachment for some how to's.